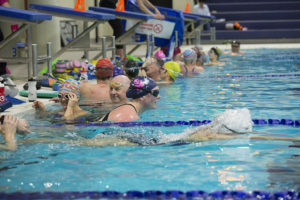 The SAA Swim Program is designed to provide a swim training regimen for adult triathletes and adult recreational swimmers of all levels and experience. We provide 4 different 50-meter lanes to accommodate different speeds and ability levels. A certified coach leads each practice and provides feedback. Our focus is on stroke technique, endurance, strength, speed, and fun. Swimmers can expect to log between 1000 and 3000 meters per workout. We provide two 60 minute swims per week, from October through June, Wednesday and Friday early mornings at Watermania in Richmond. Join us for coffee at Starbucks at Ironwood after each swim! New members are welcome to come for 1 FREE try-out. In late spring and through the summer, we also enjoy open water swims at Boundary Bay. These tend to be scheduled with less notice as they are subject to weather and tides. Make cheques payable to Steveston Athletic Association. A swim suit, goggles, fins and a pull-buoy are required. Paddles and a snorkel are recommended as well.